Tooie: So, how many of you friendly people have seen the first episode of Kimba the White Lion? :) If you have seen it, you might remember that cute lil mouse in the first 2 frames. Why he was wearing a tie I'll never know, but it's real cute! Anyways, I always thought Kimba had mouse-like ears. I thought it be a cute idea changing the story of the first episode slightly. Hope you think its cute too! This is our first fanart. Koie: These characters were very fun to draw. They're just really cute. 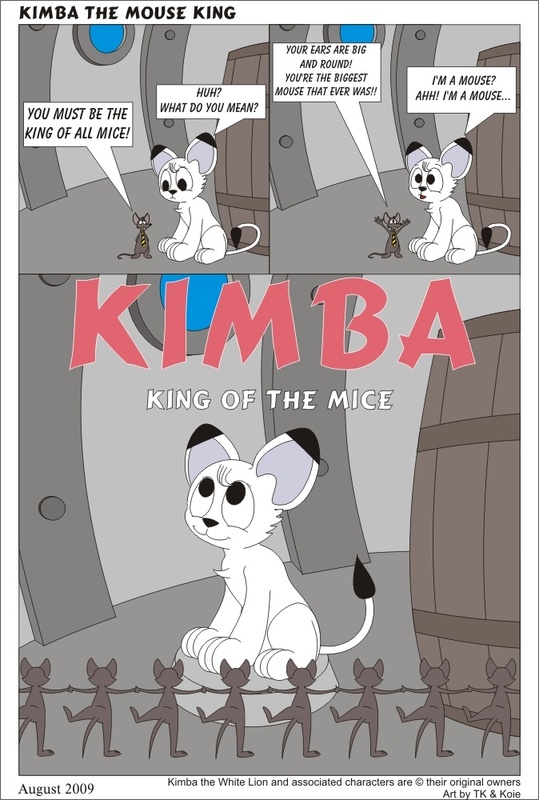 I totally believe that Kimba would be gullible enough to fall for what the mouse said. :) We might do some more fanart in the future. Bet he gets mouse snacks whenever he wants. His subjects are constantly confused at how bad their king is at keeping track of his personal servants. This kid can really exploit the situation here if he put some thought into it.